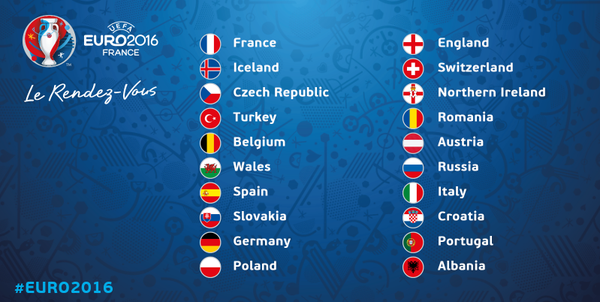 Finally we have the complete list of the teams for the Euro 2016 Tournament. Big names that have missed out in Europe this year are Benzema, Reus, Balotelli, Mata, Costa, Trapp, Isco, Kompany and Torres whilst from England Noble, Drinkwater and Townsend all miss the cut. Harry Arter has left the Irish squad due to injury. 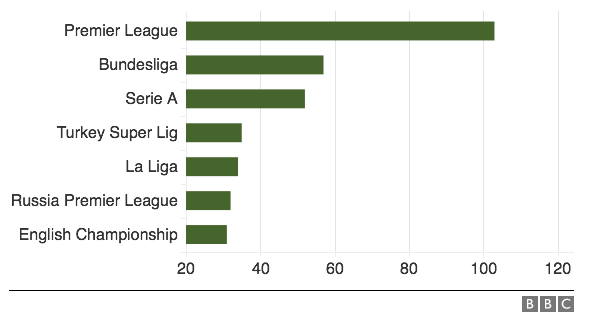 The Premier League now represents nearly 20% of the players in the Euro 2016 Championships this year, showing just how dominant this league is and the determination of foreign players to play in it. Goalkeepers: Joe Hart (Manchester City), Fraser Forster (Southampton), Tom Heaton (Burnley). Defenders: Gary Cahill (Chelsea), Chris Smalling (Manchester United), John Stones (Everton), Kyle Walker (Tottenham Hotspur), Ryan Bertrand (Southampton), Danny Rose (Tottenham Hotspur), Nathaniel Clyne (Liverpool). Midfielders: Dele Alli (Tottenham Hotspur), Ross Barkley (Everton), Eric Dier (Tottenham Hotspur), Jordan Henderson (Liverpool), Adam Lallana (Liverpool), James Milner (Liverpool), Raheem Sterling (Manchester City), Jack Wilshere (Arsenal). Strikers: Wayne Rooney (Manchester United), Harry Kane (Tottenham Hotspur), Jamie Vardy (Leicester City), Daniel Sturridge (Liverpool), Marcus Rashford (Manchester United). Goalkeepers: Alan Mannus (St Johnstone), Michael McGovern (Hamilton Academical), Roy Carroll (Linfield) Defenders: Craig Cathcart (Watford), Jonathan Evans (West Bromwich Albion), Gareth McAuley (West Bromwich Albion), Luke McCullough (Doncaster Rovers), Conor McLaughlin (Fleetwood Town), Lee Hodson (MK Dons), Aaron Hughes (free agent), Patrick McNair (Manchester United), Chris Baird (Derby County) Midfielders: Steven Davis (Southampton), Oliver Norwood, (Reading), Corry Evans, (Blackburn Rovers), Shane Ferguson (Millwall), Stuart Dallas (Leeds United), Niall McGinn (Aberdeen), Jamie Ward (Nottingham Forest) Forwards: Kyle Lafferty (Norwich City), Conor Washington (Queens Park Rangers), Josh Magennis (Kilmarnock), Will Grigg (Wigan Athletic). Goalkeepers: Darren Randolph (West Ham), Shay Given (Stoke), Keiren Westwood (Sheffield Wednesday). Defenders: Cyrus Christie (Derby), Seamus Coleman (Everton), Ciaran Clark (Aston Villa), Richard Keogh (Derby), Shane Duffy (Blackburn), John O’Shea (Sunderland), Stephen Ward (Burnley). Midfielders: James McClean (West Brom), Glenn Whelan (Stoke), James McCarthy (Everton), Jeff Hendrick (Derby), Stephen Quinn (Reading), Wes Hoolahan (Norwich), David Meyler (Hull City), Robbie Brady (Norwich), Aiden McGeady (Everton). Forwards: Jon Walters (Stoke), Shane Long (Southampton), Robbie Keane (LA Galaxy), Daryl Murphy (Ipswich). Goalkeepers: Wayne Hennessey (Crystal Palace), Daniel Ward (Liverpool), Owain Fon Williams (Inverness Caledonian Thistle). Defenders: Ashley Williams (Swansea City), James Chester (West Bromwich Albion), Ben Davies (Tottenham Hotspur), James Collins (West Ham United), Chris Gunter (Reading), Neil Taylor (Swansea City), Jazz Richards (Fulham). Midfielders: Joe Ledley (Crystal Palace), Joe Allen (Liverpool), David Vaughan (Nottingham Forest), Jonathan Williams (Crystal Palace), David Edwards (Wolverhampton Wanderers), George Williams (Fulham), Aaron Ramsey (Arsenal), Andy King (Leicester City). Forwards: Gareth Bale (Real Madrid), David Cotterill (Birmingham City), Hal Robson-Kanu (Reading), Simon Church (MK Dons), Sam Vokes (Burnley). Goalkeepers: Etrit Berisha (Lazio), Alban Hoxha (Partizani), Orges Shehi (Skenderbeu). Defenders: Lorik Cana (Nantes), Arlind Ajeti (Frosinone), Mergim Mavraj (FC Cologne), Elseid Hysaj (Napoli), Ansi Agolli (Qarabag), Frederic Veseli (Lugano), Naser Aliji (Basel). Midfielders: Ledjan Memushaj (Pescara), Ergys Kaçe (PAOK), Andi Lila (Giannina), Migjen Basha (Como), Odise Roshi (Rijeka), Burim Kukeli (FC Zurich), Ermir Lenjani (Nantes), Taulant Xhaka (Basel), Armir Abrashi (Freiburg). Forwards: Bekim Balaj (Rijeka), Sokol Cikalleshi (Medipol Baksasehir), Armando Sadiku (Vaduz), Shkelzen Gashi (Colorado Rapids). Goalkeepers: Robert Almer (Austria Vienna), Heinz Lindner (Eintracht Frankfurt), Ramazan Oezcan (Ingolstadt). Defenders: Aleksandar Dragovic (Dynamo Kiev), Christian Fuchs (Leicester City), Gyorgy Garics (Darmstadt), Martin Hinteregger (Borussia Moenchengladbach), Florian Klein (Stuttgart), Sebastian Prodl (Watford), Markus Suttner (Ingolstadt), Kevin Wimmer (Tottenham Hotspur). Midfielders: David Alaba (Bayern Munich), Marko Arnautovic (Stoke City), Julian Baumgartlinger (Mainz), Martin Harnik (Stuttgart), Stefan Ilsanker (RB Leipzig), Jakob Jantscher (Lucerne), Zlatko Junuzovic (Werder Bremen), Marcel Sabitzer (RB Leipzig), Alessandro Schoepf (Schalke). Forwards: Lukas Hinterseer (Ingolstadt), Rubin Okotie (1860 Munich), Marc Janko (Basel). Goalkeepers: Thibaut Courtois (Chelsea), Jean-François Gillet (Mechelen), Simon Mignolet (Liverpool). Defenders: Toby Alderweireld (Tottenham), Laurent Ciman (Montreal Impact), Jason Denayer (Galatasaray), Christian Kabasele (Genk), Jordan Lukaku (Oostende), Thomas Meunier (Club Brugge), Thomas Vermaelen (Barcelona), Jan Vertonghen (Tottenham). Midfielders: Mousa Dembélé (Tottenham), Marouane Fellaini (Manchester Utd), Radja Nainggolan (Roma), Axel Witsel (Zenit). Forwards: Michy Batshuayi (Marseille), Christian Benteke (Liverpool), Yannick Carrasco (Atletico), Kevin De Bruyne (Manchester City), Eden Hazard (Chelsea), Romelu Lukaku (Everton), Dries Mertens (Napoli), Divock Origi (Liverpool). Goalkeepers: Danijel Subasic (Monaco), Lovre Kalinic (Hajduk Split), Ivan Vargic (Rijeka). Defenders: Vedran Corluka (Lokomotiv Moscow), Darijo Srna (Shakhtar Donetsk), Domagoj Vida (Dynamo Kiev), Sime Vrsaljko (Sassuolo), Gordon Schildenfeld (Dinamo Zagreb), Ivan Strinic (Napoli), Tin Jedvaj (Bayer Leverkusen). Midfielders: Luka Modric, Mateo Kovacic (both Real Madrid), Ivan Rakitic (Barcelona), Marcelo Brozovic (Inter MIlan), Ivan Perisic (Inter Milan), Milan Badelj (Fiorentina), Marko Rog (Dinamo Zagreb), Ante Coric (Dinamo Zagreb). Forwards: Mario Mandzukic (Juventus), Nikola Kalinic (Fiorentina), Marko Pjaca (Dinamo Zagreb), Duje Cop (Dinamo Zagreb), Andrej Kramaric (Hoffenheim). Goalkeepers: Petr Cech (Arsenal), Tomas Vaclik (Basel), Tomas Koubek (Sparta Prague). Defenders: Theodor Gebre Selassie (Werder Bremen), Pavel Kaderabek (Hoffenheim), David Limbersky (Viktoria Pilsen), Marek Suchy (Basel), Michal Kadlec (Sparta Prague), Tomas Sivok (Bursaspor), Roman Hubnik (Viktoria Pilsen), Daniel Pudil (Sheffield Wednesday). Midfielders: Borek Dockal (Sparta Prague), Jiri Skalak (Brighton), Vladimir Darida (Hertha Berlin), Daniel Kolar (Viktoria Pilsen), Ladislav Krejci (Sparta Prague), Josef Sural (Sparta Prague), David Pavelka (Kasimpasa), Jaroslav Plasil (Bordeaux), Tomas Rosicky (Arsenal). Forwards: Milan Skoda (Slavia Prague), Tomas Necid (Bursaspor), David Lafata (Sparta Prague). Goalkeepers: Manuel Neuer (Bayern Munich), Bernd Leno (Bayer Leverkusen), Marc-Andre ter Stegen (Barcelona) Defenders: Jerome Boateng (Bayern Munich), Emre Can (Liverpool), Jonas Hector (Cologne), Benedikt Howedes (Schalke 04), Mats Hummels (Borussia Dortmund), Shkodran Mustafi (Valencia), Antonio Ruediger (Roma) Midfielders: Julian Draxler (VfL Wolfsburg), Sami Khedira (Juventus), Joshua Kimmich (Bayern Munich), Toni Kroos (Real Madrid), Thomas Muller (Bayern Munich), Mesut Ozil (Arsenal), Lukas Podolski (Galatasaray), Andre Schurrle (VfL Wolfsburg), Bastian Schweinsteiger (Manchester United), Julian Weigl (Borussia Dortmund) Forwards: Mario Gomez (Besiktas), Mario Gotze (Bayern Munich), Leroy Sane (Schalke 04). Goalkeepers: Gabor Kiraly (Haladas), Denes Dibusz (Ferencvaros), Peter Gulacsi (Leipzig). Defenders: Attila Fiola (Puskas Academy), Barnabas Bese (MTK Budapest), Richard Guzmics (Wisla Krakow), Roland Juhasz (Videoton), Adam Lang (Videoton), Tamas Kadar (Lech Poznan), Mihaly Korhut (Debrecen). Midfielders: Adam Pinter (Ferencvaros), Gergo Lovrencsics (Lech Poznan), Akos Elek (Diosgyor), Zoltan Gera (Ferencvaros), Adam Nagy (Ferencvaros), Laszlo Kleinheisler (Werden Bremen), Zoltan Stieber (Hamburg). Forwards: Balazs Dzsudzsak (Bursaspor), Adam Szalai (Hoffenheim), Krisztian Nemeth (Al Gharafa), Nemanja Nikolics (Legia Warsaw), Tamas Priskin (Slovan Bratislava), Daniel Bode (Ferencvaros). Goalkeepers: Hannes Halldorsson (Bodo/Glimt), Ogmundur Kristinsson (Hammarby), Ingvar Jonsson (Sandefjord) Defenders: Ari Skulason (OB), Hordur Magnússon (Juventus), Hjortur Hermannsson (PSV Eindhoven), Ragnar Sigurdsson (Krasnodar), Kari Arnason (Malmo), Sverrir Ingi Ingason (Lokeren), Birkir Saevarsson (Hammarby), Haukur Heidar Hauksson (AIK) Midfielders: Emil Hallfredsson (Udinese), Gylfi Sigurdsson (Swansea), Aron Gunnarsson (Cardiff), Theodor Elmar Bjarnason (AGF), Arnor Ingvi Traustason (Norrkoping), Birkir Bjarnason (Basel), Johann Gudmundsson (Charlton), Runar Mar Sigurjonsson (Sundsvall) Forwards: Kolbeinn Sigthorsson (Nantes), Alfred Finnbogason (Augsburg), Jon Dadi Bodvarsson (Kaiserslautern), Eidur Gudjohnsen (Molde). Goalkeepers: Gianluigi Buffon (Juventus), Federico Marchetti (Lazio), Salvatore Sirigu (Paris St-Germain). Defenders: Andrea Barzagli (Juventus), Leonardo Bonucci (Juventus), Giorgio Chiellini (Juventus), Angelo Ogbonna (West Ham). Midfielders: Federico Bernardeschi (Fiorentina), Antonio Candreva (Lazio), Matteo Darmian (Manchester United), Daniele de Rossi (Roma), Mattia de Sciglio (Milan), Stephan El Shaarawy (Roma), Alessandro Florenzi (Roma), Emanuele Giaccherini (Bologna), Thiago Motta (Paris St-Germain), Marco Parolo (Lazio), Stefano Sturaro (Juventus). Forwards: Eder (Sampdoria), Ciro Immobile (Torino), Lorenzo Insigne (Napoli), Graziano Pelle (Southampton), Simone Zaza (Juventus). Goalkeepers: Lukasz Fabianski (Swansea City), Wojciech Szczesny (AS Roma), Artur Boruc (Bournemouth) Defenders: Thiago Cionek (Palermo), Kamil Glik (Torino), Artur Jedrzejczyk (FK Krasnodar), Michal Pazdan (Legia Warsaw), Lukasz Piszczek (Borussia Dortmund), Bartosz Salamon (Cagliari), Jakub Wawrzyniak (Lechia Gdansk) Midfielders: Jakub Blaszczykowski (Borussia Dortmund), Kamil Grosicki (Rennes), Tomasz Jodlowiec (Legia Warsaw), Bartosz Kapustka (Cracovia), Grzegorz Krychowiak (Sevilla), Karol Linetty (Lech Poznan), Krzysztof Maczynski (Wisla), Slawomir Peszko (Lechia Gdansk), Filip Starzynski (Zaglebie Lubin), Piotr Zielinski (Udinese) Forwards: Arkadiusz Milik (Ajax), Robert Lewandowski (Bayern Munich), Mariusz Stepinski (Ruch Chorzow). Goalkeepers: Rui Patricio (Sporting), Anthony Lopes (Lyon), Eduardo (Dínamo Zagreb). Defenders: Vieirinha (Wolfsburg), Cedric (Southampton), Pepe (Real Madrid), Ricardo Carvalho (Monaco), Bruno Alves (Fenerbahce), Jose Fonte (Southampton), Eliseu (Benfica), Raphael Guerreiro (Lorient). Midfielders: William Carvalho (Sporting), Danilo Pereira (Porto), Joao Moutinho (Monaco), Renato Sanches (Bayern Munich), Adrien Silva (Sporting), Andre Gomes (Valencia), Joao Mario (Sporting). Forwards: Rafa Silva (Braga), Ricardo Quaresma (Besiktas), Nani (Fenerbahce), Cristiano Ronaldo (Real Madrid), Eder (Lille). Goalkeepers: Ciprian Tatarusanu (Fiorentina), Costel Pantilimon (Watford, Silviu Lung (Astra Giurgiu). Defenders: Cristian Sapunaru (Pandurii Targu Jiu), Alexandru Matel (Dinamo Zagreb), Vlad Chiriches (Napoli), Valerica Gaman (Astra Giurgiu), Dragos Grigore (Al-Sailiya), Cosmin Moti (Ludogorets Razgrad), Razvan Rat (Rayo Vallecano), Steliano Filip (Dinamo Bucharest). Midfielders: Mihai Pintilii (Steaua Bucharest), Ovidiu Hoban (Hapoel Be’er Sheva), Andrei Prepelita (Ludogorets Razgrad), Adrian Popa (Steaua Bucharest), Gabriel Torje (Osmanlispor), Alexandru Chipciu (Steaua Bucharest), Nicolae Stanciu (Steaua Bucharest), Lucian Sanmartean (Al Ittihad). Forwards: Claudiu Keseru (Ludogorets Razgrad), Bogdan Stancu (Genclerbirligi), Florin Andone (Cordoba), Denis Alibec (Astra Giurgiu). Goalkeepers: Igor Akinfeev (CSKA Moscow), Yuri Lodygin (Zenit St Petersburg), Guilherme (Lokomotiv Moscow). Defenders: Aleksei Berezutski (CSKA Moscow), Vasili Berezutski (CSKA Moscow), Sergei Ignashevich (CSKA Moscow), Dmitri Kombarov (Spartak Moscow), Roman Neustadter (Schalke 04), Georgi Schennikov (CSKA Moscow), Roman Shishkin (Lokomotiv Moscow), Igor Smolnikov (Zenit St Petersburg). Midfielders: Igor Denisov (Dynamo Moscow), Dmitri Torbinski (Krasnodar), Aleksandr Golovin (CSKA Moscow), Denis Glushakov (Spartak Moscow), Oleg Ivanov (Terek Grozny), Pavel Mamaev (Krasnodar), Aleksandr Samedov (Lokomotiv Moscow), Oleg Shatov (Zenit St Petersburg), Roman Shirokov (CSKA Moscow). Forwards: Artem Dzyuba (Zenit), Aleksandr Kokorin (Zenit), Fedor Smolov (Krasnodar). Goalkeepers: Matus Kozacik (Viktoria Plzen), Jan Mucha (Slovan Bratislava), Jan Novota (Rapid Vienna). Defenders: Peter Pekarik (Hertha Berlin), Milan Skriniar (Sampdoria), Martin Skrtel (Liverpool), Norbert Gyomber (Roma), Jan Durica (Lokomotiv Moscow), Kornel Salata (Slovan Bratislava), Tomas Hubocan (Dynamo Moscow), Dusan Svento (Cologne). Midfielders: Viktor Pecovsky (Zilina), Robert Mak (PAOK Thessaloniki), Juraj Kucka (AC Milan), Patrik Hrosovsky (Viktoria Plzen), Jan Gregus (Jablonec), Marek Hamsik (Napoli), Ondrej Duda (Legia Warsaw), Miroslav Stoch (Bursaspor), Vladimir Weiss (Al Gharafa). Forwards: Michal Duris (Viktoria Plzen), Adam Nemec (Willem II), Stanislav Sestak (Ferencvaros). Goalkeepers: Roman Burki (Borussia Dortmund), Marwin Hitz (Augsburg), Yann Sommer (Monchengladbach) Defenders: Johan Djourou (Hamburg), Nico Elvedi (Monchengladbach), Michael Lang (Basel), Stephan Lichtsteiner (Juventus), Francois Moubandje (Toulouse), Ricardo Rodríguez (Wolfsburg), Fabian Schar (Hoffenheim), Steve von Bergen (Young Boys) Midfielders: Valon Behrami (Watford), Blerim Dzemaili (Genoa), Gelson Fernandes (Rennes), Fabian Frei (Mainz), Xherdan Shaqiri (Stoke City), Granit Xhaka (Monchengladbach), Denis Zakaria (Young Boys) Forwards: Eren Derdiyok (Kasımpasa), Admir Mehmedi (Leverkusen), Breel Embolo (Basel), Haris Seferovic (Frankfurt), Shani Tarashaj (Everton). Goalkeepers: Volkan Babacan (Medipol Basaksehir), Onur Recep Kivrak (Trabzonspor), Harun Tekin (Bursaspor). Defenders: Gokhan Gonul (Fenerbahce), Ahmet Calik (Genclerbirligi), Sener Ozbayrakli (Fenerbahce), Hakan Balta (Galatasaray), Mehmet Topal (Fenerbahce), Semih Kaya (Galatasaray), Ismail Koybasi (Besiktas), Caner Erkin (Fenerbahce). Midfielders: Emre Mor (FC Nordsjaelland), Volkan Sen (Fenerbahce), Hakan Calhanoglu (Leverkusen), Nuri Sahin (Borussia Dortmund), Oguzhan Ozyakup (Besiktas), Ozan Tufan (Fenerbahce), Selcuk Inan (Galatasaray), Arda Turan (Barcelona), Olcay Sahan (Besiktas). Forwards: Burak Yilmaz (Beijing Guoan), Cenk Tosun (Besiktas), Yunus Malli (FSV Mainz 05).